Turmeric is a spice from the ginger family used often in Asian cooking and taken as a nutritional supplement. As with most supplements, evidence exists to support some uses, and there are numerous unsubstantiated traditional uses. According to the National Institutes of Health (NIH), tested uses include as an antioxidant, anti-inflammatory, anti-cancer, anti-HIV and anti-viral agent, to help prevent blood clots, gallstones and liver problems and to relieve symptoms of indigestion, irritable bowel syndrome, scabies and arthritis. Turmeric can cause allergic reactions, states the NIH. Symptoms of an allergic reaction include skin outbreaks like rash or hives, shortness of breath and anaphylaxis. People with allergies to plants in the ginger family or curcuma genus are most susceptible, as are those allergic to yellow food coloring, which is often derived from turmeric. Reactions can occur from skin contact as well as ingestion. Contact dermatitis, an itchy rash, is a sign. Turmeric side effects are typically associated with large doses or prolonged usage, explains the NIH. The most common side effects include stomach upset, nausea and diarrhea. Turmeric is also known to cause heartburn in people with ulcers. Standard supplementation dosing, according to the NIH, is capsules from 400 milligrams to 3 grams divided over the course of a day. For supplementation in tea form, use 1 to 1.5 grams of dried turmeric root once or twice a day. 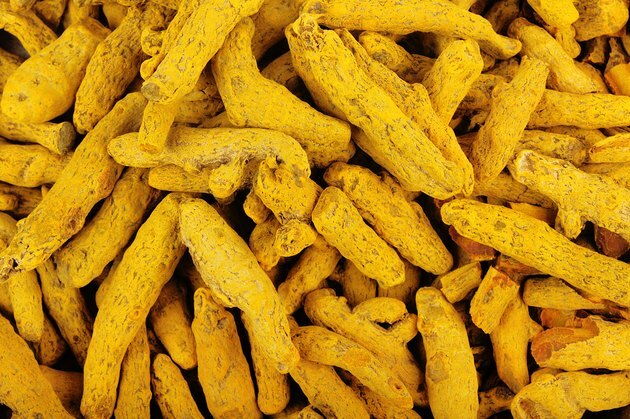 The Memorial Sloan-Kettering Cancer Center cautions that turmeric may interfere with chemotherapy treatments, and that people with gastrointestinal disorders, gallstones or bile-duct blockages should not take turmeric. Turmeric should not be taken by pregnant women; it can induce menstruation and abortion, according to Drugs.com. The NIH points out that the safety of turmeric supplements is not established for children, that they may increase the risk of bleeding, lower blood pressure and possibly weaken the immune system. Turmeric can have interactions with other drugs or supplements. Potential drug interactions exist with some anticoagulants and antiplatelets, camptothecin, celiprolol, cyclophosphamide, doxorubicin, mechlorethamine, midazolam and medications metabolized by CYP3A4 enzyme, as outlined by Sloan-Kettering. The NIH adds potential interactions with blood pressure and diabetes medications, anti-inflammatory drugs and cholesterol regulators. Interactions may occur with other supplements and herbs that affect these conditions as well. Consult your doctor before beginning any supplement regimen.